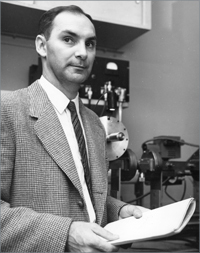 Manfred Biondi is an American physicist, who researches electron-ion collisions. His institutional affiliations include the Westinghouse Electric Corporation and University of Pittsburgh. March 5, 1924Birth, Carlstadt (N.J.). 1944Obtained SB, Massachusetts Institute of Technology (MIT), Cambridge (Mass.). 1949Obtained PhD in Physics, Massachusetts Institute of Technology (MIT), Cambridge (Mass.). 1949 – 1960Research Physicist to Advisory Physcist (1949-1957) and Manager, Physics Department (1957-1960), Westinghouse Electric Corporation, Pittsburgh (Pa.). 1960 – presentProfessor of Physics (1960-1986) and Emeritus Professor of Physics (1986-present), University of Pittsburgh, Pittsburgh (Pa.). 1972 – 1973Visiting Fellow, Joint Institute for Laboratory Astrophysics (JILA), National Bureau of Standards. 1976 – 1986Exchange Professor, University of Paris. 1984Awarded Davisson-Germer Prize in Atomic or Surface Physics, American Physical Society. 1985 – 1988Member, Army Basic Research Steering Committee (1985-1988) and Chair, Army Basic Research Steering Committee (1987-1988), National Research Council. Both employed at University of Pittsburgh. Both employed at Westinghouse Electric Corporation. Both employed at Westinghouse Electric Corporation and University of Pittsburgh. Professor of Physics and Emeritus Professor of Physics. Research Physicist to Advisory Physicist and Manager, Physics Department. 1984 Davisson-Germer Prize in Atomic or Surface Physics Recipient. Obtained SB in 1944 and PhD in 1949. Member, Army Basic Research Steering Committee and Chair, Army Basic Research Steering Committee. Oral history interview with Manfred Biondi, 2008 August 16. Oral history interview with Arthur V. Phelps, 2008 October 14. Oral history interview with John F. Waymouth, 2008 October 14. Oral history interview with Raoul N. Franklin, 2008 October 15. Oral history interview with Thomas M. Miller, 2008 October 14.